TropSoils is a collaborative research program whose goal is to develop improved soil management technology for developing countries in the tropics. Primary funding is provided by the U.S. Agency for International Development through Grant DAN 131 1-G-SS-1083-00. This action is in support of Title XII "Famine Prevention and Freedom from Hunger" of the Foreign Assistance Act. C. BEGINNERS GUIDE TO THE ACID3B EXPERT SYSTEM. Step 3. Remove the operating diskette. Insert the ACID3B diskette. Check that the following three files are on the diskette by typing dir and pressing : EXSYS.EXE, ACID3B.TXT, and ACID3B.RUL). If these files are not present, the ACID3B system will not run. You have now started ACID3B. This section includes a sample run of the program using as data soil order Ultisol, great group Paleudult, soybean cultivar Willis, DEPTH INCORP. 15, BULK DENSITY 1.1, ECEC 4.0, EXTRAL 3.2, no green manure added, Fineness factor .7, CaC03 equivalent 1.1, and pH 5.0-5.5. Notice that along the bottom of the screen the following appears. These instructions will appear at the bottom of each screen that requests data. Step 13. Press 8 then . Next, soil great group information is asked for. Step 14. Press 1 then . All the Ultisol great groups will be listed. Press any key and the rest of the great groups will be listed on the next screen. Step 15. Press 12 (Paleudults) and then . tolerances of the above crops. Step 16. Press 2 and then . The next screen will ask for the cultivar. Step 17. Press 1 and then . The value of the variable DEPTH OF INCORP is needed. Please input the value of DEPTH OF INCORP. : the depth of incorporation of the lime in centimeters (15 cm is a usual value). The value of the variable BULK DENSITY is needed. Please input the value of BULK DENSITY: the usual soil bulk density that is needed to calculate weight/volume conversions. (values range from 0.6 to 1.8 or so) kg/L. Please input the value of ECEC: the "effective cation exchange capacity" obtained by summing KCl extractable Al, exchangeable Ca, Mg, K, and other cations units are cmol/kg. Step 22. Type 1 and press The value of the variable FINENESS FACTOR is needed. Please input the value of : the.proportion of lime which passes a 60 mesh sieve (given in fraction from 0 to 1.0). Step 23. Type .7 and press . Please input the value of : the calcium carbonate equivalent as determined by adding excess HCl and back-titrating with NaOH according to standard procedures (ASA Monograph No. 9). Values should range from 0 to 1.8 (MgC03 about 1.8, CaCO3 about 1.0). Step 24. Type 1,1 and press . The final data asked for will be pH. Step 25. Type 3 and press . Data entry is now complete. The choices are now displayed with the most likely first. this has on the final conclusion by selecting the change and rerun option, . You will be shown a list of all the input you provided to the program. Enter the number or numbers of the items you wish to change and the computer will redisplay the screens which ask for the data. After you input the new data, the list of all the input will be redisplayed. If the data is the way you wish it, press to run the data. An example of how to change an entry and rerun the system is given in the next section. If you press you will be given the option of running the program again from the beginning. example, if you wish to change the crop you may do so without having to re-enter the rest of the data. The second way is to rerun the system using all new values. We will return again to the recommendations displayed at the end of the program. You may change as many variables as you wish. In this example we will change the crop (line 1). Step 4. Type 1 and press . The next screen will confirm your selection and display all the values you have entered. Step 5. Press and the program will run again and give new recommendations. Running the program again with new data. Refer again to the instructions displayed at the bottom of the screen when recommendations are given. Step 1. Type D and you will be given the option of running the program again and putting in new data. Step 1. Press 2 and then . This leads to a directed graph of ACID3 expert system. (If you have a monochrome monitor and the screen is completely green, press until the chart is visible.) As indicated by the commands given at the bottom of the screen, it is possible to scroll the chart up or down and use the commands given (Key: PgUp PgDn Home End X=exit ?=Help). To restart the system PRESS D (Done) and run again. If you do not wish to continue by re-entering the system, you may type and have the option of either stopping or rerunning the system from the beginning. 1. Respond affirmatively to the question Do you wish to have the rules displayed as they are used (Y/N). Unlike the example used in C above, rules that have been found to be true will be displayed as the program proceeds. 2. When indicated by the program information line at the bottom of the paper, you may type WHY to see the rules used. Pressing when a rule is displayed will allow you to see previous rules in the chain. program, the program information line at the bottom of the page will instruct you to type the line number in order to see the rules used in making that recommendation. Typing the line number in the IF part will allow you see previous rules on the chain. The probability value assigned indicates the likelihood of the solution. For any rule, it is possible to see what reference materials were used by pressing . will give you more detailed information on the program. This information is used in determining P and K fertilizer requirement for areas within Sitiung. 1. Do you agree with the predicted lime requirements given for the text soil and crop data? How do these compare with lime requirements you would make using the same data? 2. Do you feel that the interpretations, cautions and informative notes included in the output were sufficient? 3. Do you think the system asks the right questions in the right order? If not, please explain the sequence you would have preferred. 4. Do you have a different recommendation philosophy which you feel would be more appropriate? 5. Under what conditions do you think this system would be most useful? What modifications or additional considerations are important in your situation? 6. Did you have any particular difficulty using this system? 1. Growth limiting effects are primarily due to exchangeable Al + H (exchangeable acidity) although if all cations are present in very small quantities some lime is probably needed to provide Ca. It is assumed that toxicity to exchangeable acidity is closely related with Al + H saturation. 3. Organic material seems to reduce lime requirements. The approximation is currently 10 ton/ha of fresh organic material reduces lime requirement by 1 ton/ha. 4. Lime requirements need to be based on soil analyses in order to accurately reflect the soil conditions. 5. 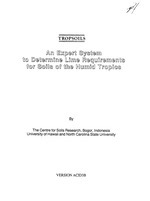 Although data is sparse, an attempt is made to determine the approximate effects of lime quality on the lime requirement. Included are the neutralization value relative to calcium carbonate and an estimate of physical reactivity as related to the particle size. The estimate of neutralization value is a relatively well defined laboratory procedure in which an excess of acid is added to the lime and allowed to fully react. The excess acid is back-titrated to estimate the unreacted acid for calculation. physical reactivity of the limestone. Here many factors have been discussed and are relevant to field estimation of time required after application before crops can be planted. One of the simpler measurements of lime quality as affected by particle size is given by the estimate of the amount of lime of various particle sizes needed to give approximately equivalent yields. neutralize 1 cmole of Al + H in field studies adjusted for both bulk density and depth of incorporation. In this case 1.9 cmol of Ca was required for each cmol of Al + H, the bulk density was assumed to be 1.0, and the depth of incorporation was assumed to be 15 cm. Preliminary data suggest approximately 0.53 cmol KClextractable acidity is neutralized for each cmol of Ca added as CaCO3 (Wade et al., 1985). This corresponds to a relation of 1.9 cmol of CaCO3 being required for each cmol of extractable acidity, a value much in keeping with results reported elsewhere (Kamprath, 1985). This reference points out the need to consider the effectiveness of lime in neutralizing the extractable acidity. Such data need to be obtained in field studies if possible because of the need to ensure that one is testing the liming material and soil reactivity in conditions that are representative of the situation or group of farmers to which the eventual recommendation is intended to apply. soils of the Ultisol, Oxisol, and Inceptisol orders. In addition, the system has additional information pertinent to the Sitiung region, Indonesia. The general recommendations are based on other relationships such as a general reactivity of 2 cmol of CaCO3 for each cmol of extractable acidity. Levels of critical aluminum saturation are, so far, the same for the general recommendation as for the specific location in Sitiung. Other data and results from the Tropsoils work in Sitiung are incorporated such as minimal requirements of P and K for soybean, rice, cowpea and peanut. however with the usual loss in flexibility for certain types of expert system construction. simple rules. These search rules will be dicussed in the sequence in which they operate. 1. Rule selection. The first search or "pattern matching" that is done on the knowledge base begins with the choiceses. Choices in EXSYS are all the potential conclusions from which the system can choose in presenting final results. None, one or several choices are possible with any consultation (or "run" of the system). The first choice is selected to determine if it can be proved true or false. The search routine determines which rules have this choice in their THEN part. If there are more than one, the first rule (in numerical order) is the one chosen for analysis. No lime is recommended probability (100/100) <- This is the first choice of the list of choices. This choice will cause RULE 11 to be selected first for analysis. No lime is recommended probability (100/100) <- This is the first choice of the list of choices. This choice caused this rule to be selected first for analysis. The search begins with the selection of a rule to analyze. The first "Choice" in the list of Choices is selected. A rule which has this choice in its THEN part is then selected. If there is more than one rule with the choice in its THEN part, the rule that has the smallest rule number will be selected. The IF part of the selected rule will then be looked at. The first condition will be selected and determined whether it can be proved true or false from information already determined to be true. If the condition cannot be determined to be true or false based on information already in the system, the system will put the condition on screen and ask the user directly which combination of qualifiers and values are true. The order of the conditions in the first selected rule will determine the order of the questions asked of the user. For example, one would prefer that the most likely conditions be asked first. This can be done by placing the most commonly selected choice as the first in the choice list (Choice 1). This order should match the "directed graph" or decision tree that we recommend you first construct to document the logical organization of the expert system. In other words, the first condition in the rule should ask the most general information. This will ensure that the system will reduce the number of rules to be searched in subsequent steps. If a very specific condition were placed first, it might ask for information that is irrelevant to most of the system.